What is Song of Blades and Heroes? specifically written for 15mm miniatures mounted on round bases but it can be played in other scales. It is part of a line of games I am developing, called "1-cent gaming" because we use cents as bases, and also because the games are designed to be quick, inexpensive and requiring very little space. SBH can be easily adapted to larger scales. As long as your minis are singly based, you can play SBH. The rules are written for two players but it's possible to play with more. creature. One turn represent a few seconds. Measuring is very simple. All distances and ranges are measured with three measurement sticks labeled Short, Medium or Long. No halving, no multiplying, no weird fractions, no counting centimeters. may measure distances at any time. SBH can be played on a 2'x2' wargame table (a DBA table is perfect) or on a hex grid. Models are described by a profile. Stats are Quality, Combat and Special Rules. SBH is an action point system that requires NO book-keeping at all. You decide to roll one, 2 or 3 dice vs the model's Quality, and get to make one action per success you get. If you roll 2 failures, though, play passes to the opponent. Players are always on their toes. Combat is simple-- roll a die for both combatants and add their Combat scores. If you beat the opponent, he either recoils or falls down. If you double his score, you kill him. If you treble his score, you inflict a gruesome kill, requiring morale rolls. Magic using models can use magic to make ranged attacks or to "pin down" enemy models. Ranged attacks are weak, but pinned down targets are extremely vulnerable. Special Rules are "rule breakers", allowing a model to do something not normally allowed. For example, a model with the Shooter special rule is armed with a ranged weapon. Using a point system, you can create your warband or your own miniatures. 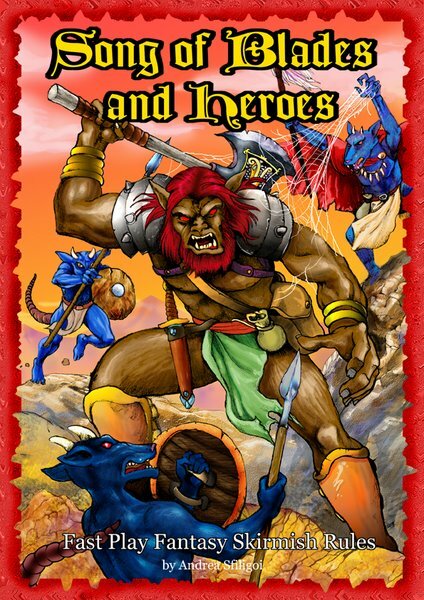 Stats for more than 180 soldiers, monsters, beasties and animals are included in the rulebook. Simple campaign rules let your warband grow more powerful battle after battle. There are 6 scenarios included with the game. The full rules can be learned in just one game. A game lasts 30-45 minutes. You can play a mini campaign (3 scenarios) in a long evening. Expansions and campaign books are already planned. Welcome to Song of Blades and Heroes! This is my blog for wargamers interested in my fantasy skirmish rules. To buy a PDF copy of the rules, send $4 via Paypal to andreasfiligoi@gmail.com. Before buying, you can read a game preview -- just ask me for it and I'll email it to you.